A high ankle sprain is an injury to the anterior tibiofibular ligament which joins the tibia and fibula together just above the ankle. This ankle injury is generally more severe and more complicated to treat than a normal sprain, Read more on the causes, symptoms, and treatment of a high ankle sprain. Symptoms of a high ankle sprain include pain when pressing in on the tibiofibular ligament which joins the tibia and fibula at the bottom of the leg/top of the ankle. Swelling and bruising will be seen at the front and outside of the ankle. The athlete will have difficulty walking and when the ankle is rotated and dorsiflexed with toes and foot pushed upwards pain will be reproduced. 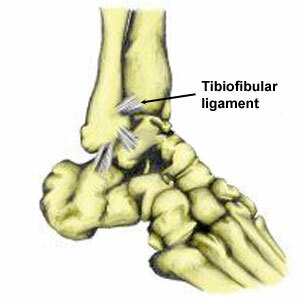 The most commonly injured ligament in a high ankle sprain is the anterior tibiofibular ligament. Severe injuries can also cause damage to the syndesmosis which is a membrane connecting the Tibia and Fibula. A high ankle sprain is sometimes associated with a fracture of one of the lower leg bones and is often more severe than the normal lateral ankle sprain. It can also be more problematic to treat. As soon as possible after exercise, the principles of PRICE or protection, rest, ice, compression, elevation should be applied to reduce pain and limit swelling. Ice should not be applied directly to the skin but through a wet tea towel or using a commercially available hot and cold pack. Ice can be applied for 10 minutes every hour initially with the frequency reduced to two or three times per day as symptoms require. 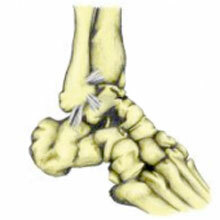 Elevating the foot will help swelling and tissue fluids drain away from the site of injury. A doctor, physiotherapist or other sports medical professional may prescribe anti-inflammatory and painkilling medication such as ibuprofen to help reduce pain and swelling. Ibuprofen should not be taken if you have asthma. Always check with a doctor before taking medication. Sports massage can be applied after a period of 72 hours to help reduce swelling, loosen muscles and prevent the build-up of scar tissue. Electrotherapy such as ultrasound can help with swelling and aid the healing process as well as reducing pain. Once the ankle is pain-free, the physical therapist would advise on mobility and strengthening exercises to restore the ankle to full function. Wobble board exercises should be done to restore the co-ordination or proprioception of the injured ankle.